Situated in the Albatross 3 complex. The property sleeps 6 plus travel cot but also has a double airbed (extra charge) that can be used in the dining area. The property is fully equipped and has UK satelitte TV, Wifi available and lots of sports equipment that can be used including bikes, tennis rackets, beach equipment etc (conditions apply). ‘Albatross 3’ is the jewel in the crown of Mar de Cristal which is arguably one of the best and least spoilt beach resorts in Spain. Largely unspoilt by mass UK tourism this resort is lovely and peaceful outside the main season but bursts into life in July and August when the Spanish start to holiday. The crystal waters of the Mar Menor are a short walk away with its warm calm and shallow waters being ideal for young children. On the other side of the peninsula (5-10 minute drive) is the Calblanque national park with truly fantastic beaches fronting the Mediterranean sea. The property has 3 bedrooms 2 doubles and one twin. The upstairs master bedroom is spacious with an ensuite complete with bath, shower, bidet and toilet. The spacious sun terrace can be accessed directly from the bedrooms patio doors. The two ground floor bedrooms have a shared shower room complete with shower, toilet and bidet. One of the bedrooms has a double the other has twin beds. The sun terrace can also be accessed independently of the master bedroom and is a lovely quiet area with a comfortable lounge area and two sun loungers. On the ground floor we have a covered patio area accessed by the patio doors. This during the day is a well shaded area to dine in. extending from the patio is an attractive secluded garden area complete with an artificial grass area which is a lovely soft play area for youngsters. The kitchen is very well equipped and is not lacking any equipment should you what to fully self cater. There is a fan assisted oven with ceramic hob, microwave, toaster, kettle, large fridge with freezer. We think there is everything the budding chef would require. We are a happily married couple with grown up children. We live in the village of Alne near York. We moved here from Bradford in 2010. we are both active in the local community between we are on the local cricket club committee, the Village Hall committee, the local leisure association committee and the local Lions. When looking for a property we wanted a secure location for our young daughter to play, good ground floor facilities for elderly parents to enjoy, a short stroll to a save beach, more Spanish than British yet be able to buy a British paper, excellent local activities, peaceful tranquil location and most of all a real home from home. Outside of July and August the first thing you notice in the silence and tranquility. In July and August the village comes to live with families from mainly Spain but also the UK and Holland. The local beaches are fantastic the local beach on the Mar Menor is extremely quiet with lovely calm warm and safe water. The near by Cal Blanque beaches are in our opinion probably the best we have ever seen, this is not Spain as you would imagine. Within the village is an extremely friendly tennis club which offers great value for all the family. En suite bathroom to bedroom 1 with bath/shower over, sink wc and bidet. Ground floor bathroom with separate shower, wc, sink and bidet. Large living dining room with 2 large very comfortable sofas, flatscreen TV with UK channels, take your own Sky viewing card to view Sky, DVD and Playstation (no games), coffee table, side tables with lamps and dining table to seat 6 with sideboard. Cooker, 4-ring hob, extractor hood, large fridge/freezer, dishwasher, microwave, toaster, sandwich maker and sufficient kitchen equipment for gourmet cooking. Indoor dining with 6 seats. Two outdoor dining areas with 10 seats. High chair available to hire. A speaker is available compatible with Iphone 4 and with others if you have the correct wire. A large selection of books are available. A selection of beach toys and sports equipment is provided. A selection of DVD's are available. These are available to use but if you require a guarantee that they are in working order a fee of 100 euros is required. The La Manga Club area is famous for its golf courses and is about 10 minutes drive away. A well maintained clean pool. Notes on accommodation: The property has been fitted with the highest quality inverter air conditioning/heating units to the living room and all bedrooms. The property was chosen and has been equipped to suit the needs of a young family with aged grand parents. Outside: Ground floor covered patio surrounded by well kept colourful garden with direct access to large pool and beautiful poolside gardens. Direct access from first floor master bedroom through patio doors onto large sun terrace. Patio equipment includes 2 separate dining areas with dining table and 6 chairs in each area. Good range of outdoor seating with 2 high quality adjustable sun loungers. Utility Room: Washing machine, iron, ironing board and various beach and play equipment. Cleaning / Towels / Linen / Maid service: All towels and linen including pool towels provided. Weekly maid cleaning service available at extra cost. The property is no smoking, should anyone smoke within the property there will be an extra charge. We stayed at the end of October so Mar De Cristal was very quiet. We found that car hire was essential. The house itself is just what we were looking for - plenty of room for the 4 of us. It was spotless and had everything we could need for our holiday. The house is in a lovely setting with well kept gardens and a shared swimming pool and the complex is very secure with key access only. Carol, who looks after the house for Peter and Margaret, was a godsend. Can't thank her enough as any question I had she answered immediately and was very helpful. We either ate out at night in Los Belones, where there are many good restaurants, or along La Manga strip. We had a couple of days on the beach at La Manga and our boys (11 & 13) had a great time snorkelling in the Med. The best part of the holiday for me was the local natural reserve at Calblanque. We visited twice and it is breathtakingly beautiful. Protected beaches, sandstone, heathland and mountains all full of wildlife and definitely worth going to. The views from the top of the mountain are amazing! Peter and Margaret - thank you so much for our stay. Good sized property in quiet location on a nicely maintained private complex. Stayed 8 days four adults two teens. Lovely pool never too busy and plenty of space at property to relax. Quiet area short walk to beach and spar. First time to area and we liked the predominantly Spanish atmosphere. We would be happy to stay at this villa again, although in order to justify the luxury tag a few small improvements could be made. For example more and better crockery mugs glasses, ( not enough cereal bowls for 6)- maybe due to breakages over season. We broke one glass, decided to replace with a new set of 6. Cupboards full of stuff that was just in the way, Boys couldn’t use wardrobe in twin room. Lastly outdoor dining furniture looking a bit tired and could do with updating. Small things that would make it a 5 Star experience. We had a car, not used every day but useful. Plenty to walk to or cycle. Good communications with owner, and advice on directions car hire etc. Overall nice and quiet holiday, and would go again. Me, my daughter-in-law with 8 months old grand-son and neice have just returned from a week's holiday in Murcia staying in Mar de Cristal at this property. The property was clean, and very well presented, the general feel was homely and not that of a holiday let. We arrived on the 3 Kings holiday week-end so all the shops in the Los Belones the closest town as well as the local supermarket were closed. This did not affect us since Peter and Ann (the lovely couple who take care of the property) provided basic provision to last us the week-end. The cafe Arena was opened and we spent several evenings down there enjoying tapas ans sangeria. Peter and Ann really helped to make our stay pleasurable by providing us with transportation and being our tour guide which we greatly appreciated and, dare I say at a fraction of the cost the local taxis would have charged. None of us are drivers, and without a car getting around will be very restricted. The walk out to Los Belones took us 30 minutes pushing a buggy, the fact that there are no pedestrianised foot paths and its along a busy dual carriage way does not make for an enjoyable relaxing walk. However once we got there, we were rewarded with a good selection of cafes, restaurants, bars and stores to have a browse. I would strongly recommend a day visit to Cabo de Palos and Cartengena, since we visited out off season there was nothing to happening in Mar de Cristal since the area was virtually uninhabited, so ability to travel out was essential. My niece was able to buy a day pass to use the swim pool and spa at the La Manga golf club and had a most pleasing day experience. In terms of value for money and restful place to be this property tick all the boxes, however having transportation is essential. This house was a perfect place for our 12 day stay in Spain. It was spotless, well-equipped, spacious and, very importantly for us, had excellent air-conditioning. Our family of 2 adults and 3 young teenagers had plenty of space. Great out-door patio and balcony too. It is situated in a courtyard development with a decent sized pool which had a common sense policy as opposed to strict rules. After hours swimming was allowed and the kids loved their night-time swim before bed. Town, or 'urbanization' itself wasn't particularly nice but there were nice beaches and excellent restaurants a 10 minute drive away. Tennis breaks organised at the excellent nearby Mar De Cristal tennis club (2-3 minute walk). Coaching can be arranged with a top quality coach at keen prices. There are two main beach areas. The Mar de Cristal beach is only a 5 minute stroll away and fronts the Mar Menor which is an inland sea water lake. The waters are very warm, calm and very shallow. The beach is great for small children. The Calblanque national park has the most amazing sandy beaches you could imagine and is a 5-10 minute drive away. Murcia airport is 20-30 minutes away by motorway. Car hire is easy from Murcia airport or taxis can be arranged at a cost of €45-55. Alicante airport is 60-90 minutes away. While car hire is advised it is not essential for the fit and able as all facilities can be accessed by walking or bikes, we have 4 bikes which can be used but we take no responsibility for their condition. if you want to use these we charge 100 euros as a maintenance charge to ensure they are in working order when you arrive. Bikes can also be hired locally. While Mar de Cristal has a limited number of restaurants and bars the nearby (2km) small town of Los Belones has a very wide choice of bars, restaurants, shops and banks. 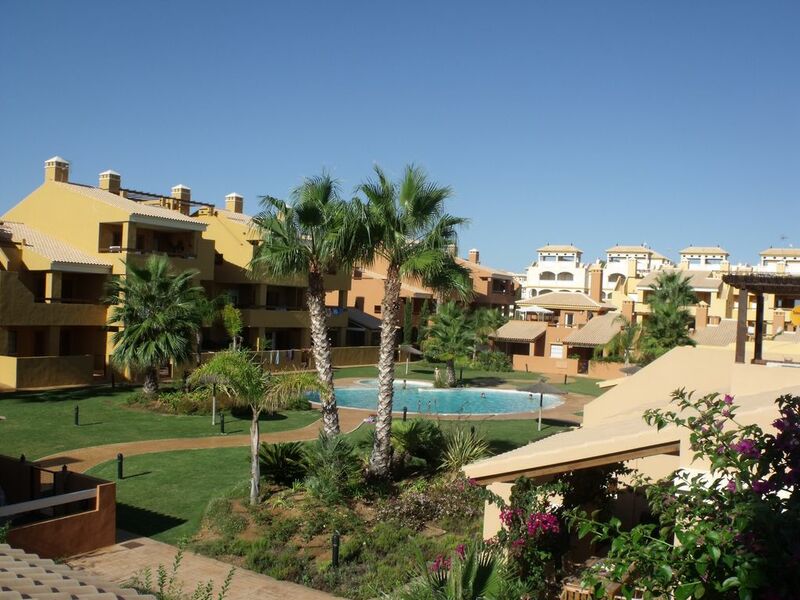 The property is 10 minutes drive from the famous La Manga Club resort and a similar distance from the beautiful fishing port of Cabo de Palos and La Manga strip. A little further afield in the historic town of Cartagena with its Roman ruins. Booking Notes: Changeover Day: Changeover date is flexible. Notes on prices: Prices are for the property per week in UK Pounds. Minimum charge per rental £155. Anyone smoking within the property will forfeit their deposit.